Even the most corporate-raiding sailor still considers himself something of a conservationist; the time we all spend amongst nature’s beauty means we pay more attention than most to the problems facing our natural world. But to the overwhelming majority of sailors, seamanship and respect for other vessels is at least as powerful as our love of nature, which is why there’s such a love/hate relationship between sailors and the activists at Sea Shepherd. Here at SA, we are overwhelmgly in favor of what they do. If world governments took more responsibility for the stewardship of our oceans, there wouldn’t be a need for the Sea Shaepards, but they aren’t, so we can thank this intrepid organization for their incredible efforts. We don’t need to get too deep into who they are; the Whale Wars show and this story show just how agitating Paul Watson and his groupies can be. New York Times Correspondent Ian Urbina shared a brilliant story this morning that shows the other side of the organization, though – the side that stands up for those who cannot. It’s a story of a ten thousand mile chase through squalls, storms, and the Southern Ocean. The cast of characters includes ships named after a Simpsons creator and a game show host and the world’s most wanted pirate fishing captain, and it all ends with a mysterious sinking and the hunters rescuing the hunted. We’re not even going to give you an excerpt; the article is the single best piece of maritime journalism we’ve seen this year, so go over to the NYT site and check it out right now. 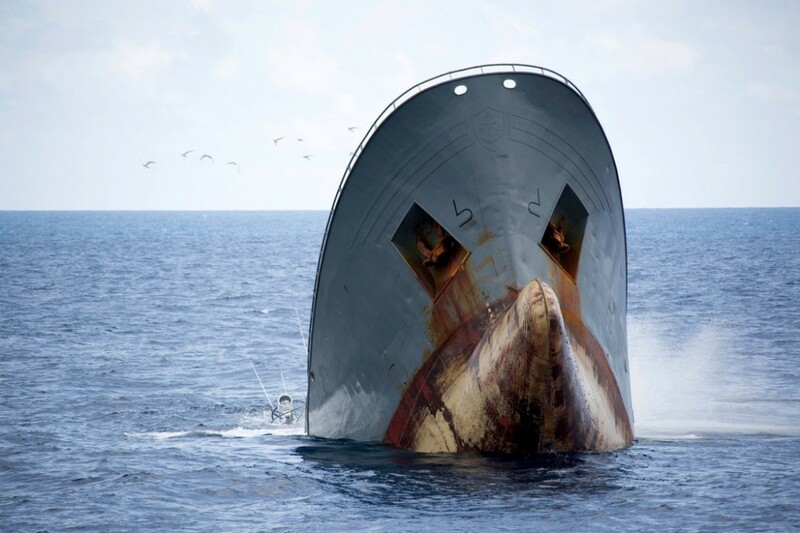 Photo from Simon Ager/Sea Shepherd Global. Title inspiration comes from the realization that a good song can become great when sung by a hot sailing chick.